A high quality 2 bedroom apartment, with large garden and Sun Room is located between Polis and Latchi Marina and a short drive to the beach. FULLY FURNISHED and with TITLE DEEDS. Separate fully equipped kitchen, utility room and private covered parking. A UNIQUE Apartment. Everything about this property shouts quality and class. From the delightful sun room to the recently paved garden area, the care and attention given to the decoration of this property becomes immediately apparent. Once through the front door, welcome hallway and a second door, one is immediately struck by the quality of the finishes and furniture. The very generously sized lounge has a top of the range 3 piece leather suite, a highly attractive glass topped coffee table and LG flat screen TV. The diner includes a delightful round wooden dining table. The focal point of this area is the south facing sun room. Originally an uncovered balcony, the balcony was recently ‘closed in’ with ‘tilt and turn’ windows making this a real sun trap. In addition, the stunning mountain views can best be enjoyed from here whilst enjoying a fresh orange juice and coffee in the morning and a pre- dinner gin and tonic at the end of another balmy Cyprus summers day. 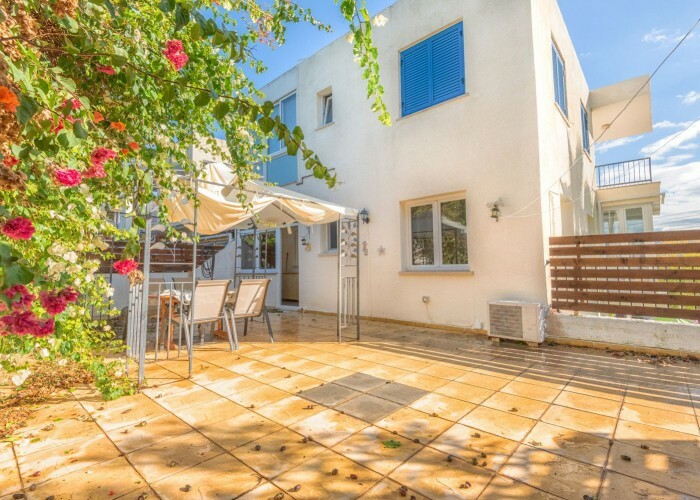 Unusually for a Cyprus apartment this property has a separate kitchen, and what a well equipped kitchen this is. Features include an LG fridge/freezer, LG washing machine, De Detreich oven and a double sink. Add to this, the marble kitchen tops and the largs amount of drawer and cupboard and it can be seen how well equipped this kitchen really is. In addition there is a utility room next to the kitchen which offers plenty of room for any additional goods and extra storage space. Both bedrooms are doubles. The master has plenty of wardrobe space and offers views to both south and west. Bedroom 2 again has plenty of wardrobe and drawer space and views to the east. The modern shower room lies between the two bedrooms and includes a walk in shower unit, sink and W.C and electric heater. There is a large outside private area which is tiled and includes a Kleftico oven and Gazebo – the ideal place in which to relax and enjoy the sunshine. This apartment also has the benefit of a covered parking area.